PAX Unplugged, like a healthy diet, felt very balanced for me this year. I played with friends, I browsed the expo hall, I did some events, and I ate cheesesteaks. Here’s part 2 of my recap, where I recount eating something much better than a cheesesteak. Where are all of the golf games out there? It’s indisputably the greatest sport and it deserves an engaging board game. Of course, if I think about it for two seconds, there’s far too much luck necessary to make it into a simulation and far too little physical skill involved in a board game. I suppose you could make it a flicking game? But then it becomes a flicking game, even if the theme is golf. Where was I? Oh yeah, Pocket Pitch and Putt. It’s a golf wallet game that fully embraced the randomness aspect I spoke of. 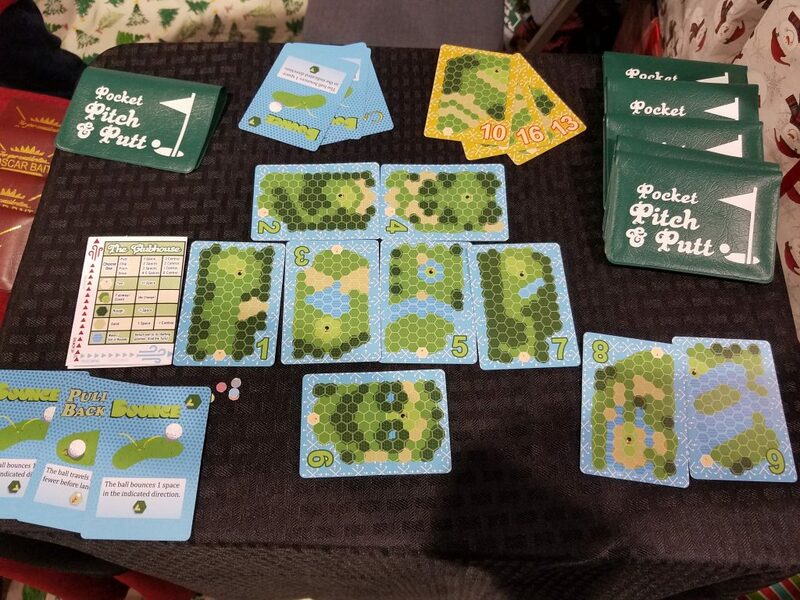 The visual design looks cool, with golf holes presented on a hex grid, but it boils down to a “take that” card game. Sad, because the person who demoed the game was so excited and her booth looked really cool. I just don’t see the game being particularly fun. Usually I impulsively skip over all of the RPG booths because I don’t have time to learn any systems or run any RPGs amidst all of the board games I need to play and review. Plus I’ve got D&D 5e. What else would I never need? 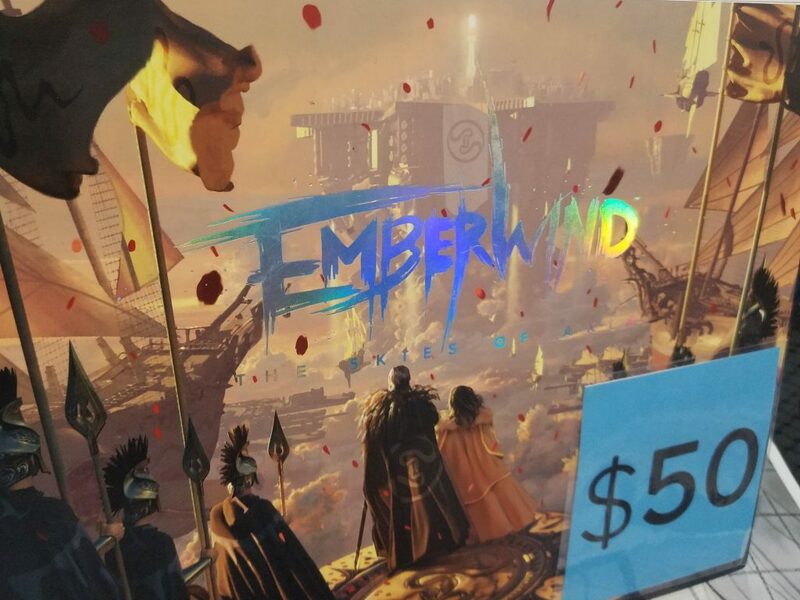 But I was goaded into checking out Emberwind by a couple of friends, because their friend was helping demo it, and what started as a way to meet a new friend became genuine interest in this system. I’ll have a full review of the starter book in the future, because we’ve now played the whole thing, but here’s the pitch: Emberwind is an original setting based around floating city rocks and magic crystals. I mean, it’s not the most original thing in the world, but the art is spectacular and makes everything much more compelling to think about than it has any right to be. The system is supremely flexible, with not only pre-created characters but differing levels of character creation complexity. The starter book can be played with a DM or without. There’s a nifty choose your own adventure-style system for making decisions, and combat is relatively simple and quick. It’s being released sort of in installments, and right now the character guide is in beta. Like I said, I’ll have a full review later, but at the booth I was seriously intrigued by this system where I could get a one minute explanation, a character sheet, and jump right into a round of combat. It’s an RPG focused on eliminating the buy-in costs. You can actually hand a new player a character and begin. We here at The Thoughtful Gamer are slowly creeping into the train game niche. I understand that some people never escape from its route-building, pick up and deliver clutches, so we’re treading carefully. Nonetheless when Orion and I got a chance to play Age of Steam, one of the classics of the genre, we jumped at the opportunity. 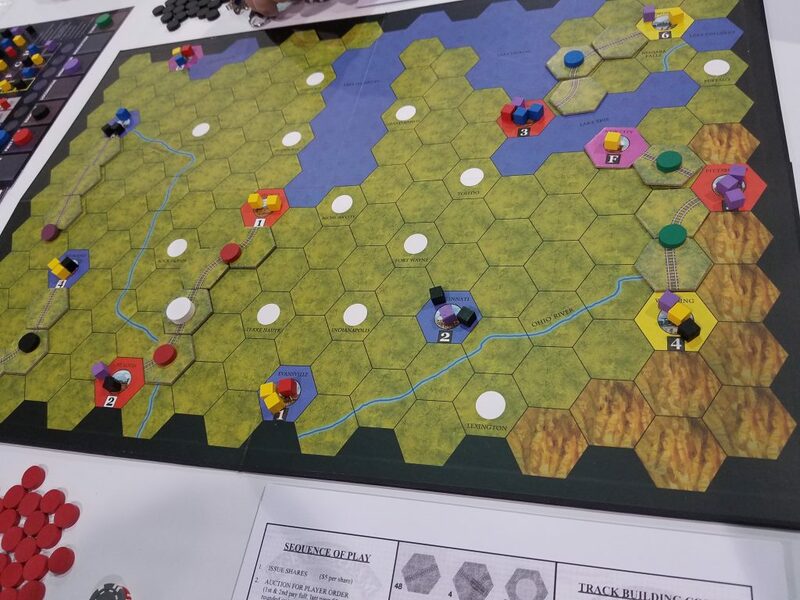 Where 18XX games are more focused on manipulating a market, Age of Steam is all about the routes. You’re battling viciously with your opponents and your own bank account to try to transport cubes from one spot to another. Cubes are picky and only want to go to certain places, and train routes are expensive to build, so you take loans and hopefully don’t go bankrupt. It’s definitely one of those games where you need to have an end game state in mind from the very beginning. Money is so scarce, and the map ends up being so small, that you really need to fight over possession of your area of the map. There’s room to pivot strategies, but it’s very hard and seems to involve a lot of careful planning and maneuvering. There were a couple of frustrations I had with Age of Steam, most of them coming from the fact that you have to plan your turn very far in advance, and failure is extremely punishing. But it’s a game that digs into your mind a little, and you start thinking about it at unexpected times. This is a game I have not thought about at all since PAX. Indeed, I forgot to even put it on my initial list for these posts until I went through my pictures from the event. Oh yeah, I guess I did play that. Partway through the explanation of BotC, I realized what I was hearing. The person, who might have been one of the designers, was quick to rebut my assertion. He informed me that it was definitely so much more than that, and while there were certainly some aspects that borrow from that classic, BotC has changed so much as to be a completely different experience. It was Werewolf with more stuff. I don’t necessarily mean that as a pejorative. It’s just fact. And as I’m not a fan of Werewolf at all, I didn’t like Werewolf++ 2000 either. Granted, many of the changes are actual improvements. Two stand out. First, every person has a role. No more of this benign “villager” nonsense. That’s cool, as everyone can feel involved equally. Second, people who have been killed off remain involved in the game. More precisely, they get one more vote, and the vote requirements to kill someone are tied to the number of living players. Instead of an innovation it feels more like a band-aid. The result of this change is that by the endgame the living people stop having nearly as much influence, as the ghosts can manipulate the critical vote. Again, I guess it’s better than the original, but it’s not ideal. The number of roles they’ve created for this game is truly absurd, but it creates a wall between new players and the experienced that seems painstakingly difficult to tear down. I spent the first third of the game staring at my cheat sheet trying to decipher all of the potential interactions. I’m someone who has played a lot of social deduction games and I still missed everything important that happened. And this was supposed to be the setup for beginners! Additionally, more roles doesn’t mean that all of the roles actually matter. My role, for instance, meant that any investigation into my character could turn up an incorrect result. As I was otherwise a good “villager”, my incentive was to simply declare my role to everyone and sit back for the rest of the game knowing that I would be inherently less trustworthy than others. As with some of my worst games of Werewolf from college, I kind of sat there and didn’t do much for 45 minutes, other than occasionally voting and voicing my suspicions, apropos of not much. I was told that once you play a few times you get used to the beginner roles and start to understand its giant incentive web. But why would I do that when I could get a better, more engaging experience from other, better social deduction games? Isn’t one of the major positives of this kind of game that it’s easy to bring new people in? 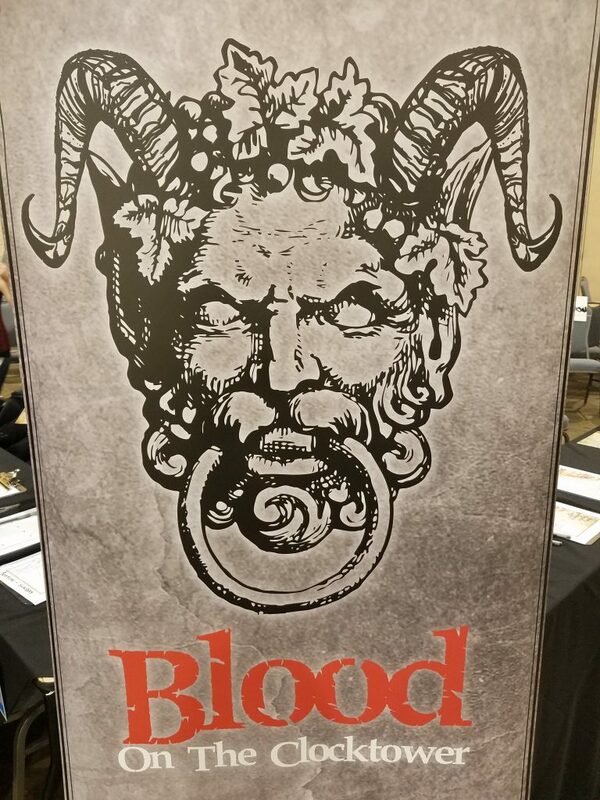 Blood on the Clocktower has a literature barrier for new players that even great teaching can’t overcome. On top of that, they don’t even get rid of the moderator role, but expand it into more of a DM kind of job. With my role in that game, for instance, any investigation into my character could result in an incorrect result, but that was up to the moderator’s discretion on any given check. That’s actually my favorite part of the game, but it requires a skilled or experienced moderator to perform the role well. Again, barriers. I was told that there are actually a number of meetups that gather regularly to play this game in various cities across the world, and I think that’s where this game will continue to flourish even after its full release. I don’t see it becoming a social deduction staple, but a cult hit for the dedicated. Given a very organized meetup that takes efforts to establish an appropriately spooky mood to turn this game into an event rather than a game, I might be persuaded to play again. For now if I want to play a game that’s bundled with a logistical problem I’ll play TI4 or an RPG. In more pleasant memories of Philadelphia, one of the greatest meals of my life took place just before the end of the con. South Philly Barbacoa is a national treasure and everything you could ever want from a hole in the wall restaurant. They make basically one thing: barbacoa, and given the acclaim they’ve received they might make the best barbacoa in the world. It was incredible. 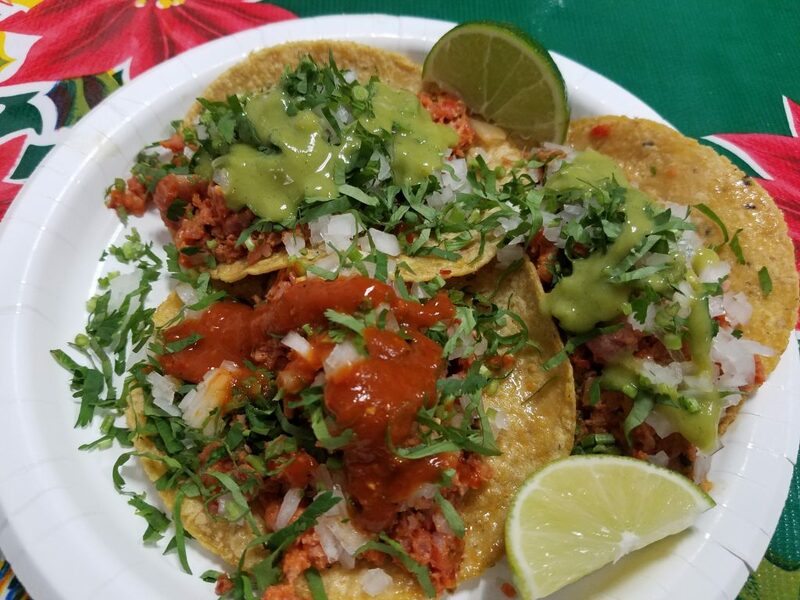 A perfect taco with fresh tortillas, perfectly roasted meat, and traditional toppings. Amazingly, even better was the consomme they make from the lamb, which will stay in my memories for a very long time. The simple soup had a depth of flavor so immense I had to close my eyes and just experience. Next year I will proudly stand in line, probably multiple times, to eat there again. Mara Johannes, the relatively new VP of Sales and Marketing for AEG, was having a very busy day when I stopped by to talk with her. Their booth was crowded, games were selling out as I perused, and evidently everyone had meetings all day with everyone. Still, after getting a few minutes to speak with Mara about AEG’s 2018/19 lineup, I got the impression that this craziness was the result of legitimate enthusiasm. She managed the madness like a seasoned conductor, assisting people who came to her with questions mid-sentence without blinking an eye. 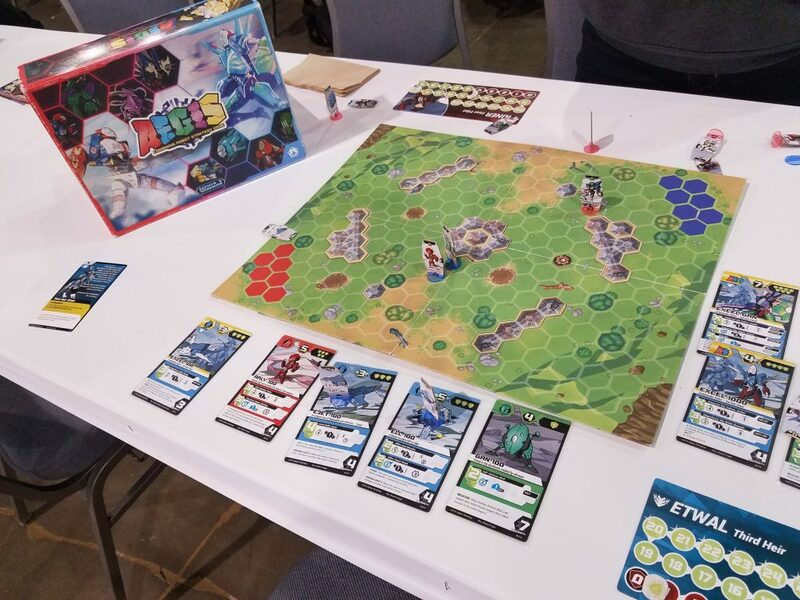 I always equate AEG with very light, popular fare like Love Letter and Smash Up, and while they do seem to stick to the lighter half of hobbyist games, I was pleased by the diversity of game style they were showcasing. 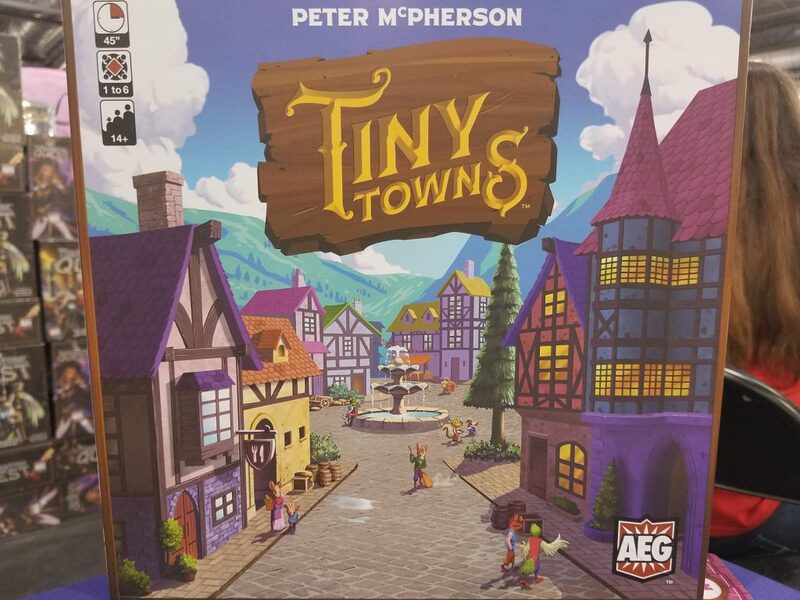 I’ve already spoken about Tiny Towns quite a bit, and I’ve interviewed the designer, so I won’t say much more about the game, but Mara did tell me that it would be their premier 1st/2nd quarter release for 2019. After that, she said there will be additional releases for GenCon. Hungry and intrepid reporter that I am, I asked once politely if she could tell me anything about that and then dropped it when she said she couldn’t. She did promise that there would be additional announcements soon. War Chest is sort of an abstract fighting game that immediately reminded me of Tash-Kalar when I looked at it. It is nothing like Tash-Kalar. Instead it’s a sort of abstract-y wargame with bag building and resource management. I don’t know what I think about this mishmash of mechanisms, but Mara made sure I got to hold one of the poker chip-style pieces. They’ve got heft! Cat Lady was majorly sold out by the time I arrived to the booth, and there was a queue to demo it. I had never heard of this game before, but when trying to come up with words to describe it, Mara could only summon, “Cat Lady is…amazing”. I wish I would have had time to demo it, because it indeed looks cloyingly charming. The point is to collect as many cats as possible that you’re still able to feed and keep healthy. I didn’t get all of the details, but it seemed like a fairly light card drafting/set collection thing that is fully committed to the theme. Everyone I saw playing it had smiles on their faces. After taking a peek at Cat Lady, we moved on to a game on the complete opposite color palette: Scorpius Freighter. The main draw here is customization. Borrowing a sales pitch from the Firefly game, it’s about building up a custom crew, customizing your ship, and trying to smuggle goods through dangerous space. However, unlike Firefly, Scorpius Freighter looks to lean on more tried and true euro mechanisms. I have a feeling this one is flying (heh) under the radar, but the brief look I got intrigued me. AEG looks like it’s in a very good place. Mara had genuine excitement for what’s to come in 2019, and nothing in their booth seemed low quality or out of place. To be honest, many semi-big publishers (semi-big for the board game industry, at least) seem to always have a few games that are just…there. I saw nothing of the sort with AEG. By this point in my board game media career I’ve spoken to a number of people about their first design, and universally I get a sense of enthusiasm from them. Why wouldn’t they be enthusiastic? Designers aren’t raking in the cash, so a game design is almost always a labor of love. What sets Breeze Grigas apart from those others isn’t his enthusiasm about A.E.G.I.S, but his assuredness. A.E.G.I.S was designed and developed over 6 years, and even though it has gone through a number of changes over those years, the vision for the game remained consistent. It’s a robot combat game, borrowing elements from properties like Voltron (from what I understand–I am not an enthusiast of the genre). That means that while you start with a handful of smaller bots, you can combine them into more powerful units as you fight. I got to play an abridged game of A.E.G.I.S., and I was very impressed by the sheer amount of variety and intentional design packed into the box. Each of the letters in the name stand for a different strategic type of robot, and when you build your team you’re going to have to plan out what potential combinations are available to you. Do you want to stay lean and quick, using robots that synergize well on their own, or are you planning to stall until you can power up into a full A.E.G.I.S 5-part monster? We played with two setups that Breeze had previously selected for easy demoing, and even then he was pointing out nuances I was unable to see as a novice to the game. It wasn’t a matter of “this team is quick, and this is slow”, but a more strategically rich build. My team had a number of glass cannons with area of effect attacks–I wanted to rush in quickly, stay out of range, and poke at the enemy before erupting into a devastating finisher. His team was built for durability and a lot of combination flexibility. At one point he effectively “forked” me by putting one of my units in a position where no matter what I did he had a good out and a favorable trade. As we played, I asked a number of questions about the design, and Breeze always had a story of precisely why they had settled on that. Often it was a tale of multiple revisions after testing. I got the sense that they were relentless in trying again and again until it was right. I’m not saying it’s the best game ever–it still has a lot of the awkwardness that comes with ameritrash-style hex combat games where you kind of rush into position and sit there firing at each other, making the grid aspect more or less null. There was some additional maneuvering beyond that in our game, but not enough to completely satisfy. There’s also all of the chaos that comes with dice rolling. Still, that’s the kind of game they wanted to make, and make it they did. One of the taglines in their marketing is the “good for beginner and veteran gamers” that’s almost always an exaggeration, but I think it might be more true here. I had no problem jumping into the game, but I could also see where one could go crazy with different team builds. A.E.G.I.S is the most intriguing game of its type I’ve seen in a very long time. That’s it for most of my PAX Unplugged adventures. However, there’s still one more part of this recap–a video where I spoke with the designers of Ivion, a card-based combat game reminiscent of Mage Wars. Stay tuned! I should’ve gone to that taco place. I cannot exaggerate how delicious it was. Next year!